With approximately 100 members of the Keck Graduate Institute (KGI) community in attendance, Claremont’s Architectural Commission unanimously approved KGI’s campus housing project during the group’s meeting on Wednesday night in the City Council Chamber. When the city officials announced the approval, plenty of applause came from the audience filled with teal-clad KGI supporters. After the city planner introduced the project, KGI President Sheldon Schuster spoke in front of the commissioners. During the time for public comments, four KGI students took turns speaking in support of the project. That group included KGI Student Government President Vilma Huerta alongside Jonathon Le, Jeff Che, and Nyssa Spector. All four shared their story of how the campus housing project will impact future students. 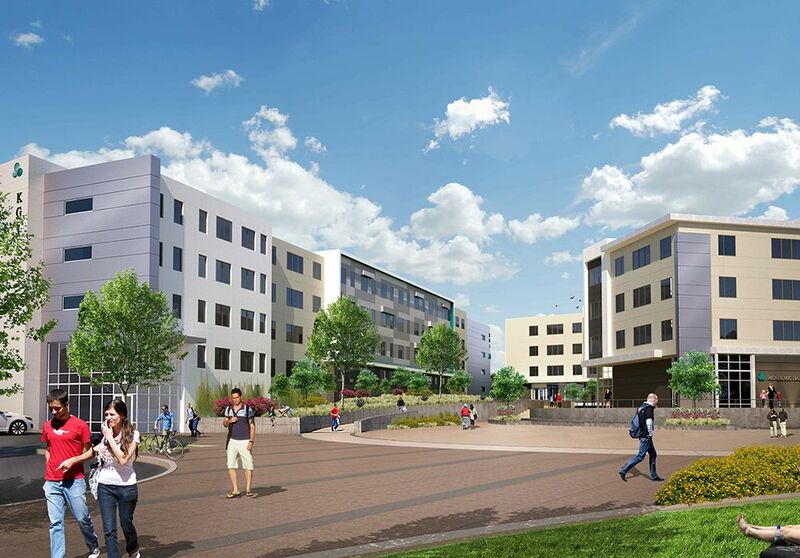 The campus housing is a highly-anticipated development for the KGI community as it will accommodate the school’s growth and the needs of its students. Additionally, the project will promote revitalization of the area south of the railroad tracks while serving as a catalyst for future growth of the Indian Hill corridor. Construction is set to start in Spring 2017 and the housing development is expected to open in Fall 2018. For updates on the project, continue to check build.kgi.edu. The project features two new four-story campus buildings on the existing vacant lot at the southwest corner of Bucknell Avenue and Wharton Drive/Santa Fe Street. The campus housing project will raise the quality of life and the level of academics for KGI students. It will also feature environment-friendly aspects, including LEED certification, walkable communities, and lower water consumption. Additional parking will accommodate the project and future KGI growth without impacting surrounding neighborhoods. Overall the development will support KGI's mission, which is to enrich society with breakthrough approaches to education and translational research in the life sciences.